There are four Dog Wardens currently employed within the Community Safety Services. They provide a 24 hour collection service of stray secured dogs every single day of the year. As well as dealing with stray dogs, they also patrol problem areas for dog fouling and enforce the Dog Control Orders when required. The Dog Wardens work closely with the RSPCA and the Police, as well as working with local dog training groups in order to try and educate dog owners and get across the responsible dog ownership message. Dog chipping cost of the service is £12. For more information or to book appointments contact the service on 01983 821000. A microchip does not replace the need for a tag on your dogs’ collar! Over four hundred dog litter bins are provided on the island, by IWC, parish Councils and other organisations. To report any incidents of dog fouling please contact 01983 821000. You must keep your dog on a lead by the roadside and under proper control in public areas. Between 1st May to the 30th September dogs are prohibited from some beaches. For details visit http://www.iwight.com/dogorders/maps.asp. Failing to be a responsible dog owner could result in a fixed penalty notice of £75. 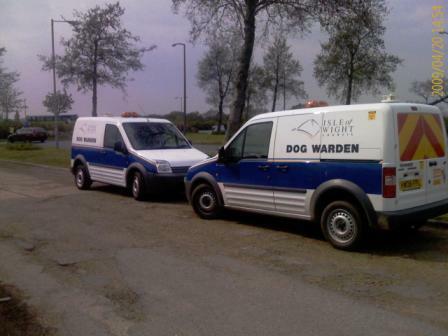 The Dog Wardens are responsible for the collection stray secured dogs 24 hours a day every day of the year. If you find a stray dog you can report it to the Dog Wardens, telephone 01983 821000 during office hours or 01983 821105 outside office hours. What happens if your dog goes missing? If your dog goes missing, report it so at the earliest opportunity. Once a dog has been collected or seized under the Environmental Protection Act 1990 section 149, it will be checked for I.D such as tags. It is a legal requirement to have a tag affixed to your dogs’ collar, (Control of Dogs Act 1992). The dog will also be scanned for the presence of a microchip. If a chip is detected then the owners can be traced through that, providing that the contact details are correct. If the owner cannot be contacted or there are no outstanding reports of missing dogs, the dog will be taken to kennels. If no owner can be found, then after the statutory seven day period the dog will be rehomed at the discretion of the Dog Warden. Handling fees £22.00 if you allow your dog to persistently stray, then you maybe liable to the handling fee on top of the normal fees. has bitten a person, or there is a very real fear that it is likely to do so. The Dog Wardens will work in conjunction with the police, when dealing with a potentially dangerous dog situation. The Dog Warden will wear a protective suit and use specified equipment for the safety of the dog and all personnel involved. DEFRA have produced a useful leaflet explaining the law in relation to dogs. Click here to download a copy.